On this episode of Clockworks we’re talking about the first season of the Netflix series “Russian Doll.” If you’ve seen it, we bet you liked it as much as we did, and if you haven’t than we highly recommend it. On this brief Clockworks episode we check in with some news about season three of Legion. On this episode of Clockworks we’re having a fully spoiled conversation about Deadpool 2, and especially about the parts of it that connect to or remind us of Legion! On this episode of Clockworks we’re talking about the Netflix limited series “Maniac.” The first half of this episode is unspoiled, and we’ll warn you before we start talking spoilery things, so you can listen even if you haven’t seen “Maniac” yet! This is the third of our bonus episodes talking about the X-Men Legacy: Legion comic books written by Simon Spurrier, and we’re talking this time about the fourth and final volume. We promised we would do this, and we are at last! This is the first of three episodes focusing on issues of the 2014 X-Men series “X-Men Legacy: Legion.” We previously did an episode about this last year, it was Clockworks episode 23. This episode of Clockworks is just an update on what to expect from Clockworks in the next little while. We’re still here, and we’ll be back in your ears soon! In this episode we talk about the characters’ journeys this season, our favourite moments, our wild speculation about season 3 and what to expect to see in your feed in the between-season. In this episode we talk about the Jon Hamm Narrator sections, about the motifs and imagery that grabbed our attention this season, and about the themes that we see in the season. We’ll be back in a week with part two, where we’ll talk about the characters’ journeys this season, our favourite moments, and our wild speculation about season 3. This is our episode about the finale of season 2 of Legion. In this episode everyone is re-examining who is the hero and who is the villain. On this episode of Legion Syd and Melanie have a long conversation, and so do David and Oliver. On this episode of Legion we find out what Melanie has been up to, and what Cary, Kerry, and Lenny are up to now. In this episode of Legion David plans to find Farouk’s body and burn it, and the Division 3 team is infected by bad ideas. In this episode of Legion David explores multiple realities, and then returns to where he started. In this episode of Legion Clark, Ptonomy, and David each interrogate Lenny and everybody wonders whose body she’s in, and Oliver hints at his plans to kill the Shadow King. In this episode of Legion David and Syd are trapped in a loop of Syd’s life. Watch it again. In this episode there is a cow. What is the deal with that cow? David rescues Ptonomy and Melanie from their mental mazes, and we get some answers about the Migo Monk. This bonus episode of Clockworks was recorded live at the Sci-Fi On the Rock convention in St. John’s Newfoundland. We talk about the nature of surreal and psychedelic art, about some symbolic aspects of Legion, and we take some questions from the audience. In this episode everyone wonders if they can trust David, we wonder if we can trust future!Syd, and David wrestles with Amahl Farouk. In this episode of Legion David returns from the orb and nothing is as simple as it seems. We are invited into madness, there are hexagons, there are dance numbers, there are stories, and it’s the future. Or is it? We’re honestly asking, that was not totally clear. In this episode of Clockworks we can barely contain our excitement for season 2 of Legion. It’s coming so soon! We spend a (relatively) short minisode reacting to and speculating about the recently released trailer for Legion season 2. In our first episode of Clockworks we said that Legion reminded us of Eternal Sunshine of the Spotless Mind. We’re exploring that connection in more depth in this bonus episode of Clockworks! In our first episode of Clockworks we said that Legion reminded us of Wes Anderson. We’re exploring that a little more in this bonus episode all about Moonrise Kingdom! In this bonus episode we talk about the Bryan Fuller tv series “Pushing Daisies”! Remember in our very first episode we said that Legion reminded us of Pushing Daises? Well we did. And now we’re going to talk about it! In this bonus episode we talk about David Haller in X-Men comics! We’re talking about issues 1-6 of X-Men Legacy: Legion. These six issues together make up Vol. 1 of X-Men Legacy: Legion. In this final bonus episode about Fargo we talk about the whole series. We talk about predators, toxic masculinity, and supernatural evil. This is the third in our series of bonus episodes about Fargo! Paul and Jan talk about Fargo season three, paying special attention to bodies, coincidences, stories, and truth. In this second super-stuffed bonus episode of Clockworks Jan and Paul take a look at the second season of Fargo. There’s a lot to talk about, so dig in! In this bonus episode of Clockworks Jan and Paul take a look at season one of Fargo, a tv show made by many of the same people who make Legion. This episode is extra-long, so maybe plan to listen to it in parts? What’s Up Next for Clockworks? Paul and Jan are checking back in with you to let you know what our plans are for the inter-season break of Legion. In this episode of Clockworks Paul and Jan let their feelings run away with them and gush about their favourite episodes, characters, performances, directors, writers, musical numbers, manifestations of the Shadow King, and moments of season 1 of Legion. We also spend a little time pondering the unanswered questions of season 1, and make our predictions and wild speculations about the future of Legion. Paul and Jan talk to cinematographer Craig Wrobleski about his work making Legion look so darn good. In this episode of Clockworks we look back over season one of Legion and talk about the big ideas we think this season has been about. Jeff Russo wrote the score for Legion, and he agreed to sit down with us and talk about the music of Legion, his approach to writing music for a tv series, his love of Pink Floyd, and more. Dennie Gordon directed fan favourite episode 7 of Legion, and we’re thrilled that she agreed to sit down with Paul and chat about that episode, and about Legion in general. In the season finale of Legion Division 3 reappears, the Summerland team try to get rid of the Shadow King for good, David flies, and Jermaine Clement sings! In the sixth episode of Legion, we’re back in a mental hospital, Lenny tips her hand to David and expresses herself through dance. Chapter 5: What’s On The Other Side? David is acting completely out of character in the fifth episode of Legion. He visits Division 3, and we come full circle, back to where it all began. Chapter 3: Shall We Begin? In the third episode of Legion, Division 3 begins interrogating Amy, Melanie wants unfiltered access to David’s mind, and what DID the stars say? In the second episode of Legion David does some memory work. He knows where he’s going, but he doesn’t know where he’s been. In the first episode of Legion David Haller has trouble knowing what is real, and so do we. 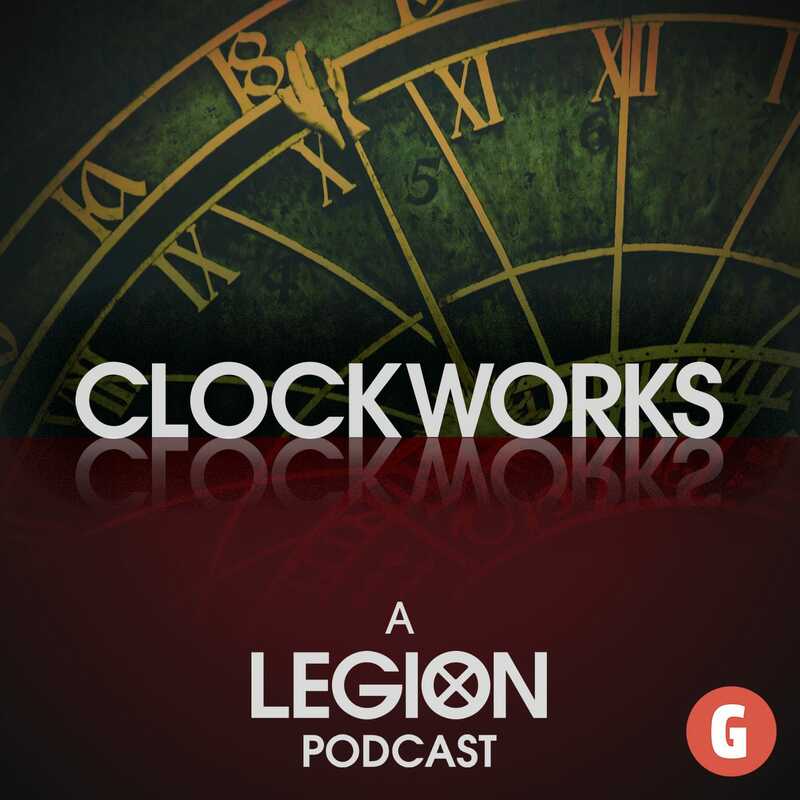 In this episode of Clockworks, Paul and Jan introduce themselves, why they love Legion, and what to expect from this podcast.